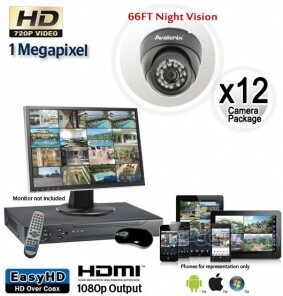 12 HD Outdoor Camera System with vandal proof dome cameras that offer 720p video resolution surpassing the conventional analog CCTV camera systems. 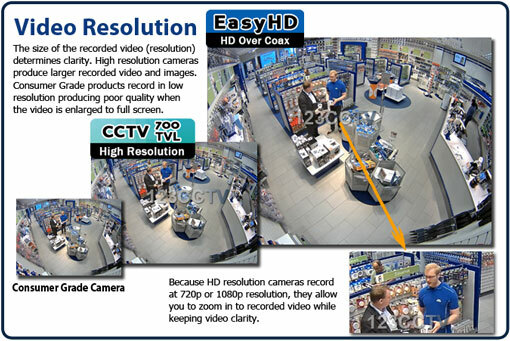 The cameras and recorder in this system record in crisp and clear high definition 720p (1280x720 pixels), in Real Time H.264, and the cameras offer 66ft of night vision in complete darkness. The megapixel outdoor dome cameras have a 3.6mm lens that provides a 80 degree angle of view. You can expect to see facial detail up to 25ft away in day or night, and general detail up to 200ft during lit conditions. These cameras are also rated at IP67 weather proof, making them able to withstand tough rain. The vandal proof feature of the camera makes it a perfect choice for homes and businesses where the cameras may be within reach of passersby, or if you are looking for a outdoor rugged camera. These vandal proof domes are made of metal and can withstand a slight blow, resist tampering, and can be mounted on a ceiling or wall.